Beans, especially graphic components, can have a dizzying number of properties. If your class inherits from Component, or JComponent, or other Swing classes, it will have over one hundred properties already. Although a builder tool like NetBeans makes it easy to edit bean properties, it can be hard to find the right properties to edit, especially for inexperienced programmers. A BeanInfo is a class that changes how your bean appears in a builder tool. 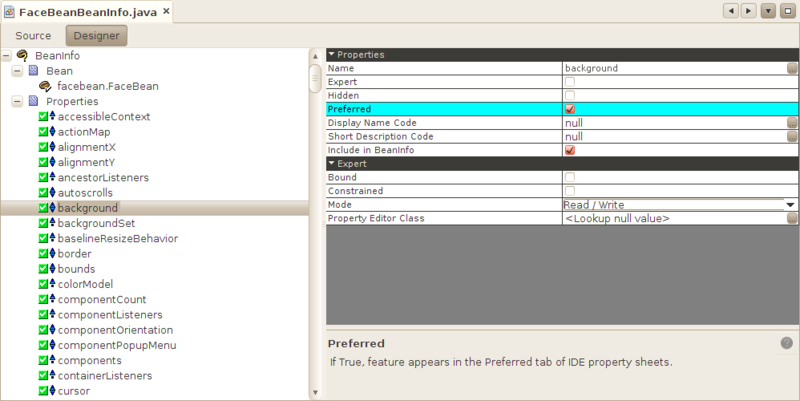 A builder tool can query the BeanInfo to find out which properties it should display first and which should be hidden. The BeanInfo class for your bean should have the same name as the bean class, with BeanInfo appended. For example, the FaceBean class has a corresponding FaceBeanBeanInfo class that describes it. Although it is possible to implement a BeanInfo class "by hand," you will find it is much easier to use a tool like NetBeans to edit the BeanInfo. 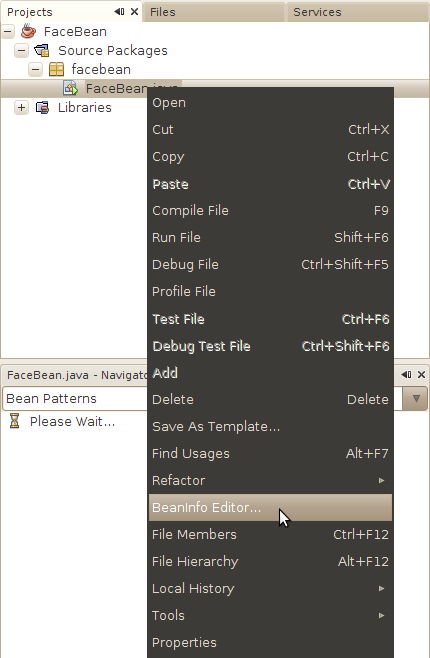 In the Projects pane, Control-click on the name of your bean class and choose BeanInfo Editor... from the popup menu. 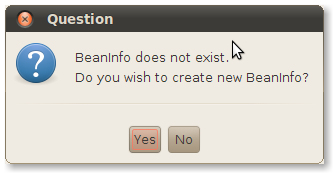 NetBeans notices you don't have a BeanInfo and asks if you want to create one. Click Yes. NetBeans creates a new class and drops you into the source code editor. Click on Designer to switch to a visual editor. Select properties from the list in the left side of the visual editor, then edit its attributes in the right side. If you don't want a particular property to appear to a developer using a builder tool, click Hidden. To signal that a property should be shown before others, click Preferred. You can also indicate if a property is bound or constrained. You can provide similar information for the bean's event sources and methods. When a builder tool loads your bean class to add it to a palette, it will automatically find the corresponding BeanInfo and use it to decide how to present your bean to the developer.